The city of San Miguel de Cozumel is divided into various neighborhoods, called colonias. The term colonia is the official designation of a municipal-government delineated residential or mixed-use area and has a recognized border. There are also neighborhoods that are called fraccionamientos (subdivisions) or areas of land that have been sub-divided into residential lots by a developer and sold off one by one to homeowners. Fraccionamientos may or may not lie within a colonia, but their borders never overlap. If a fraccionamiento is built outside of the borders of any colonia, it will most likely be re-designated as a colonia itself sometime in the future. A few of the colonias in Cozumel were built up in sections, such as San Gervasio 1 and 2, or Flamingos 1 and 2. Most of the time, the sections of the colonia developed later are merged with the earlier section to become one combined colonia, and the original 1 and 2 suffixes are no longer official. However, in the case of the colonias San Miguel 1 and San Miguel 2, the two sections became independent colonias, with the fraccionamientos of San Miguel 3 and the fraccionamiento of Flores Magon 3 (not to be confused with the colonia of Flores Magon located farther to the north east) incorporated into San Miguel 2. The map below shows the colonias and zonas of Cozumel. The area known as Corpus Christi is actually a parroquia and not a colonia. Other geographic place names have also been superseded by newer names over the years, but the older names continue to be used by locals. The name of the colonia Gonzalo Guerrero was changed to colonia Andres Quintana Roo, but nowadays you can see them both used interchangeably in daily use. Zonas are the commercial equivalent of a colonia. On Cozumel, there are the Zona Hotelera Norte, Zona Hotelera Sur, and Zona Industrial. Another type of geographical division in the city is the parroquia, or parish. This ecclesiastically named area is always centered around a Catholic church. In Cozumel, the area commonly called “Corpus Christi” is actually the parroquia of Corpus Christi, which covers the colonia of Andres Quintana Roo as well as parts of the surrounding colonias. The mislabeled street signs are not the only misleading directions you will run across here on the island. 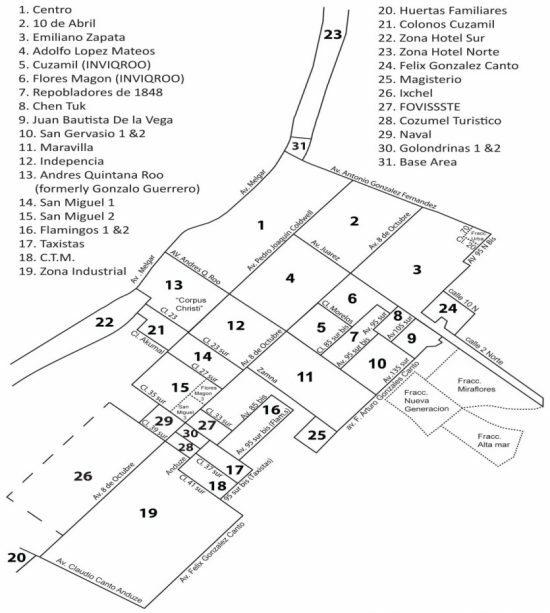 Many streets and avenues that were once indicated by a numeric designation have had that designation changed by the Ayuntamiento to a name to honor a person or a famous place, or a date to honor an historical event. Avenue 30 became Avenue Pedro Joaquín Coldwell. Avenue 65 became Avenida 8 de Octubre. Calle 11 Sur became Avenida Andres Quintana Roo. Calle 15 Sur became Avenida Xelha. These last two changes broke the old, long standing rule that avenues (avenidas) ran north-south and had the right-of-way while streets (calles) ran east-west and had stop signs. Some of these new names may make you sound like a time traveler (as in “I live on 8 de Octubre, in the colonia of 10 de Abril”), however, these name changes (and many other examples of street name changes not mentioned) are often ignored by locals, who continue to use the old numeric designations of streets when giving directions.